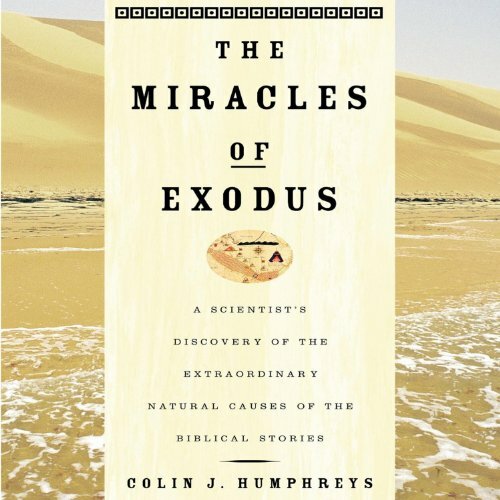 The Real Story of the Exodus Colin Humphreys, a world-renowned Cambridge University scientist, reveals for the first time the concrete, scientific truth behind the Exodus miracles. The Burning Bush: Caused by a volcanic vent that opened up under the bush. Crossing the Red Sea: The water was pushed back by a very strong wind blowing all night. This is a known physical phenomenon called wind set down. The details given in the Bible mean we can pinpoint where the Red Sea crossing occurred. Drowning Pharaoh's Army: When the very strong wind suddenly stopped blowing, the water rushed back in the form of a rapidly returning "bore" wave, sweeping Pharaoh's army into the sea. Mount Sinai: The real Mount Sinai is in present-day Saudi Arabia, not the Sinai Desert as is generally assumed. ©2003 Colin J. Humphreys (P)2014 Audible Inc.